It can sometimes take some time to find a deleted file in the Windows Recycle Bin, especially if it is only deleted sporadically and set to store Gigabytes of deleted files. While it is possible to sort the files by name, location or deletion data, and even use the search to find them in the Recycle Bin, it often takes longer than expected to restore files from there. 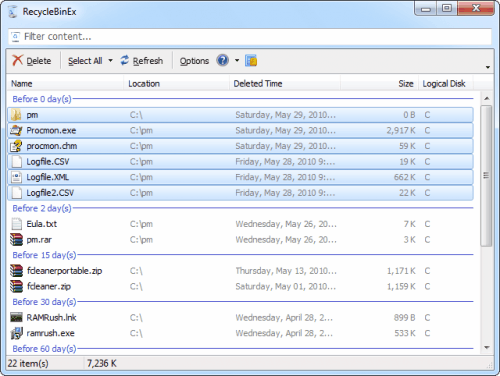 Recycle Bin Ex is a standalone program for Windows that enhances the capabilities of the Recycle Bin. The two major features that it offers are automatic deletions of files that are older than a specified age, and the grouping of files based on patterns. The interface of the program displays all files that are currently stored in the recycle bin. This looks similar to the Windows Explorer view of the Recycle Bin, with few differences. The filter content bar at the top can be used to quickly filter files based on the terms entered. The Select All menu offers file selections based on age, and the deleted time and logical disk header selections based on the date of deletion, and the logical disk the files have been deleted on. The automatic deletion of files based on their age is configurable in the Options. Here it is furthermore possible to configure the autostart of the program, and add it to the context menu of the Recycle Bin icon. Recycle Bin Ex can be a helpful program for users who regularly work with the Recycle Bin in Windows. Most users on the other hand may feel that the program does not add enough to justify its installations on the system. Those Windows users who want to try the software can download it from the developer's homepage. This sure is a realli cool feature! hi, i downloadeed recycle bin exe and it sounds like a great program but whn i open it, the names of all my files that are located in the recycle bin do not appear in the list, instead i see only one letter for each file.Please help. Thank you.